Materials that are collected as part of the AHC History Project become part of the collections of the University Archives located in Andersen Library. At University Archives, the items will be processed according to professional standards and stored in a technologically advanced, climate controlled storage center located approximately 80 feet below ground level in a hollowed out limestone cavern. The “caverns,” as they are often referred to, house a concrete structure – essentially a building within the cavern – where the materials are stored. Access to the caverns is limited to Andersen Library staff. University Archives is one of nearly a dozen units within Andersen Library that focuses on collecting, preserving, and providing access to historical information. Other units include the Charles Babbage Institute, the Immigration History Research Center, and Special Collections and Rare Books among others. When material is shipped to Andersen Library it usually arrives in the archives work room (see below) located in the underground caverns. This is a common work space for all of the units in Andersen Library. Larger collections will be initially reboxed and processed in this space. Smaller collections can be brought upstairs to the individual unit and reboxed and processed in the unit’s office space. The collection below is a relatively small shipment (7 boxes) of materials related to the AHC History Project. The boxes were shipped to the archives using a University of Minnesota Libraries service. 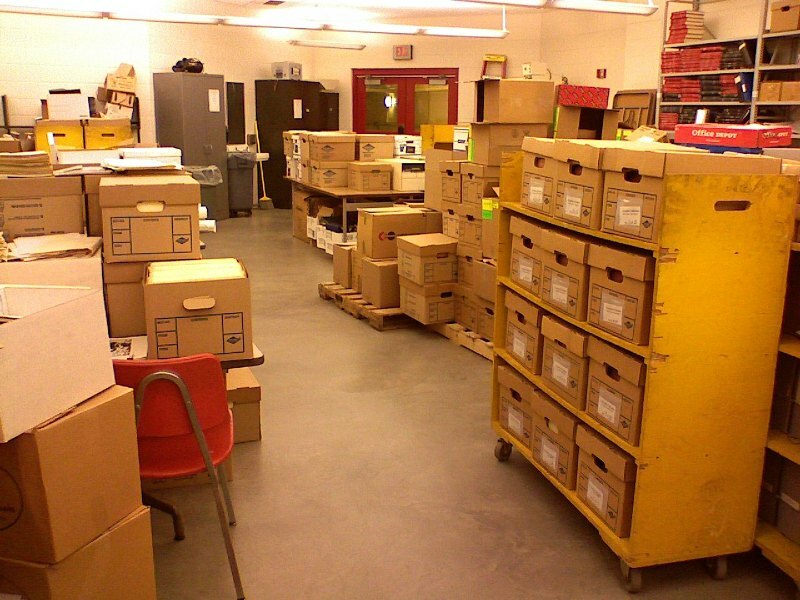 The originating office labeled the boxes to be delivered to University Archives with an attention to the project archivist. The boxes are also label “1 of #” to guarantee all of the boxes were transported together and arrived safely. 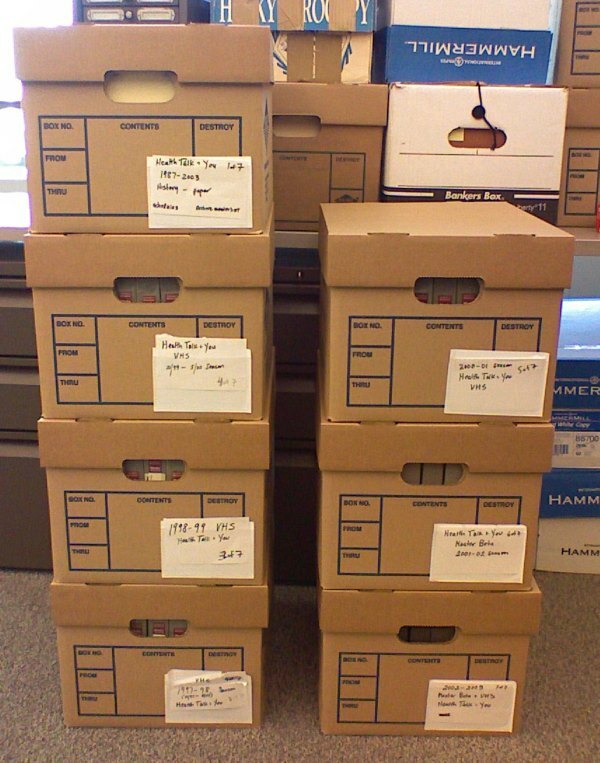 These boxes were brought up to the University Archives office space for initial processing. The material in these white banker boxes will be placed in similar sized boxes that are of archival quality, meaning sturdier construction for handling and made of acid free materials. 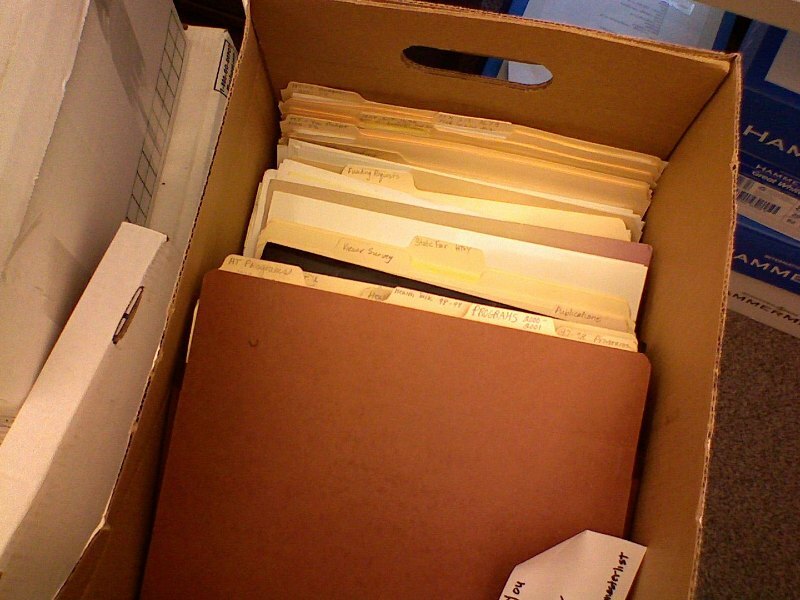 Some of the paper material may require being placed in folders or re-foldered due to the original folder’s deterioration or to create a uniformity among all folders. Part II will look at the processing and physical arrangement phase that will make the materials ready for a researcher to use. Sometimes the easiest way to begin answering this question is by discussing what should not come to the archives. Archives are not usually the best place to store material that contains private or protected data such as student records and in the health sciences, patient related information. Student records are protected by the Family Educational Rights and Privacy Act (FERPA). Patient records and material with personal health information (PHI) are governed by the Health Insurance Portability and Accountability Act of 1996 (HIPAA). Both acts protect personal information and identifiers from being published or displayed publicly. From an archives perspective, these materials are best managed by a records retention plan and not deposited in the archives. Other personal data such as personnel records, search committee files, recommendations on file, tenure decisions, and academic misconduct files are also considered private data and are usually not accepted for deposit. When an office or department is reviewing its material, it should consider the point of origin for the records. 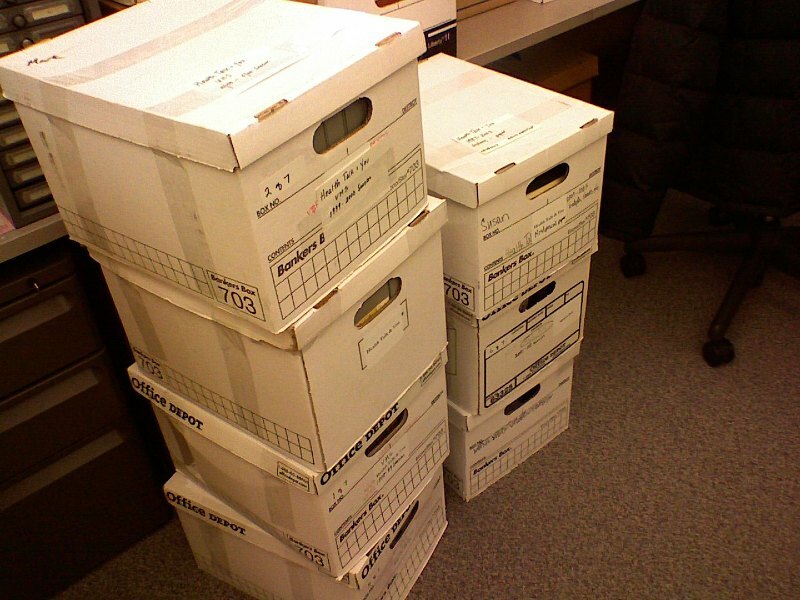 If an office has a filing cabinet full of salary surveys conducted by a related professional association, these materials would not be suited for the archives due to the fact that they were created by an outside entity and only kept in the office as a reference. A researcher wanting to learn more about salary histories would turn to the association and generally not think of looking to the office or department for that kind of information. Likewise, information produced by one office (such as a newsletter) and copies of it kept in another office as a reference, leads to duplication in the archives. If the archives collect the material produced by each office there is little need to maintain the duplicate material. In general, archives accept little material related to daily fiscal and accounting records. Again, these materials are better governed by a records retention schedule. So, what do we take? After discerning what can or should be removed from a set of materials it can become very clear what is suitable for deposit in the archives. There is never a set list of what should go to the archives. Correspondence, departmental records, research files and reports, curriculum materials, non-personnel related committee files, certain publications and audio/visual materials are all types of material housed in the archives. But it is not just about the type of material, it is also about the information found in the records. The content of the material and its relation to the office, department and institution should also be evaluated. This appraisal activity is usually conducted by the archivist or in consultation with the donor and the archivist. How are the archives different from off-site storage? Can I get access to the stuff? Archives are often synonymous with a place to store something. 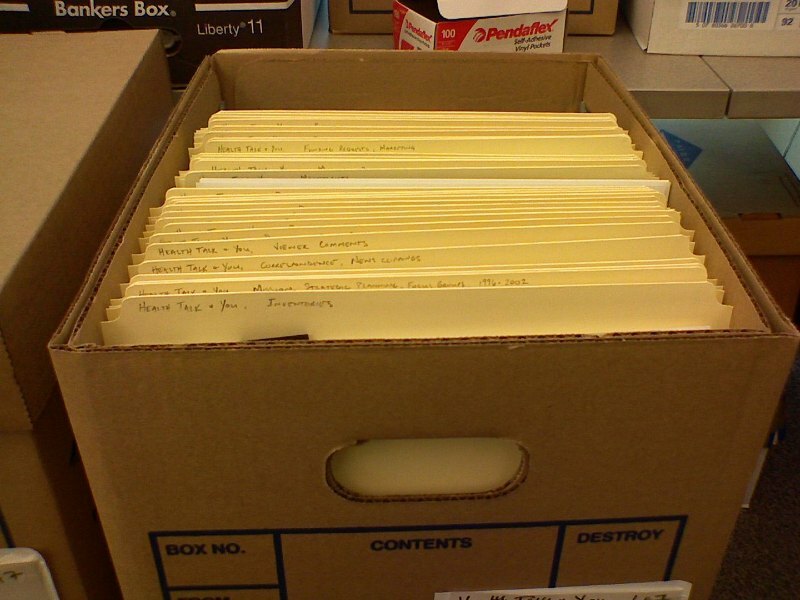 While it is true archives are made to store boxes, archives also provide a service beyond storage. Materials are reviewed by the archives staff that then creates written descriptions of what they contain. These descriptions known as finding aids help to provide access to the materials. Office and departments still have access to the materials they deposit with the benefit of discussing their needs with the archives staff. In addition, researchers have access to the same materials for their own work. Material deposited in the archives benefits two constituencies, not one. Archives commit to the long term preservation, storage and security of the materials. The longevity of the materials is not based on current staffing or outside vendor storage contracts. The University provides this commitment through the University Archives.